Our project is unique in adopting an environmentally friendly way to tackle lack of affordable housing and homelessness . The Eco Village Development Company CIC* exists to enable people to buy their own house, and to live in a more sustainable and “Green” way. Our affordable wooden eco-houses have been designed in a kit format requiring only quick, simple assembly and no skills. They can be totally self-sufficient with solar powered under floor heating, rain water recycling, grey water recycling, compost toilets, growing areas for food and solar energy generation. To create affordable living villages within natural settings based on the principles of Permaculture, working within nature in a harmonious, non-harmful way. Providing initial training will allow residents to grow their own food and share skills, goods and services, thus enhancing the potential for all. 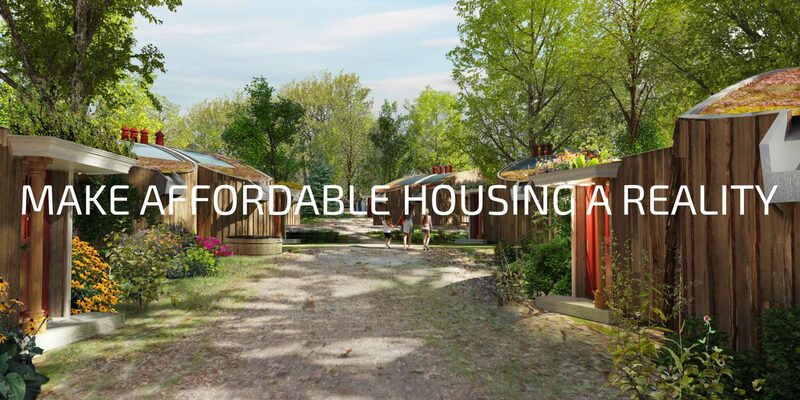 To create beautiful, comfortable houses that are ecological and affordable, and that can run ‘off-grid’ for very low running costs; with community areas and the opportunity to co-manage. To offer opportunities for community activities in the villages by creating shared spaces and facilities onsite for work, gardens and other amenities that will help enhance connection, communication and mutual support. *The Eco Village Development Company CIC is a Community Interest Company which uses all its resources for community benefit. It is an asset-locked company which ensures that funds are solely utilised for the purposes laid out in its statutes and articles and its accounts are audited and made public.